Gerber covers all the bases with this amazingly versatile tool! The Bear Grylls Compact Multi-Tool offers all survival essentials in a compact footprint that can be conveniently carried on a keychain, or in a pocket. 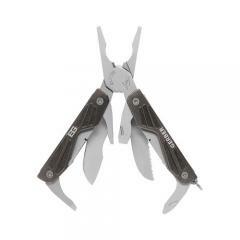 The multi-tool combines the powers of ten must-have survival components, including the following: fine and serrated edge blades, small and medium flathead and a Phillips head screwdriver, needle nose pliers, wire cutters, a bottle opener and tweezers. Nail nicks allow for effortless access and deployment of tools. The Compact Multi-Tool includes a pocket guide detailing Bear's survival advice.